Some of you may have been following the development of this Japanese Maple. I just took the brilliant red leaves off yesterday; we’ve had a lot of sun here in Portland and they did not last longer than 1 1/2 weeks. But it was a beautiful fall. In any event, the small trunk to the right—which was originally an airlayer of a branch from this tree—has grown well and feels well ‘locked’ into the nebari. The nebari is bigger than it looks, it is just covered at present with soil to establish the young trunk. I’ve been piling cake fertilizer near it to stimulate the fine feeder roots that are the ones that fuse into a solid mass eventually. The upper roots were so active that they were growing right up into the cakes. I had to literally cut off the fertilizer balls yesterday. One of the downsides of this higher rate of fertilizing is that the apex of the tree gets stronger, so I removed leaves in the top part of the tree during the growing season. It will take a couple years before this tree settles down again, but we did need that strength to fuse the smaller trunk in. The roots were so active that the tree has risen almost half an inch in the pot since this spring. 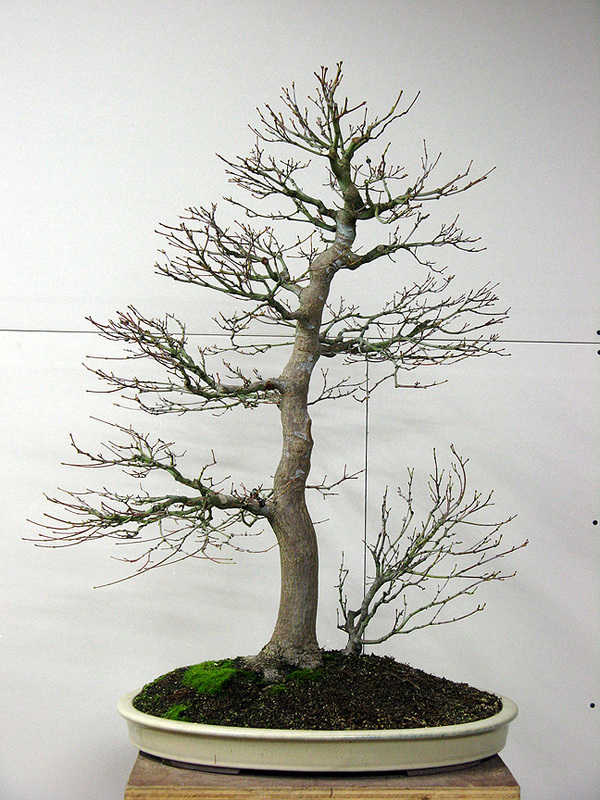 I will be repotting the tree next year, and the two photos here show the new front I’m thinking about for it. The shift is subtle, but that small difference allows an arc to the trunk that supports the flow of the tree to the right. Also, the branches are more interesting from this new view, and the small trunk pushes to the rear…which is not textbook for a parent/child style, but at least it is not a flat tree. The small trunk was left to grow wild this year. Next year some light wiring will direct the branches and a main leader will be selected. This is the tree 1 1/2 years ago, in January 2009. The lowest right branch was air-layered off and is now the small trunk seen in the photos below, as a secondary trunk. A very elegant way to improve this tree. It is bound to become a really nice tree in a few years time. I look forward to seeing it progress. A subtle but significant change, Michael, such a beautiful tree! I noticed in the older photo the texture of the bark really stands out. Is that just the lighting/photo, or has something else changed? I did a scrubbing of the bark to remove algae and it took some of the silvering with it; that will be back shortly with some sun exposure. Looks great! I’m curious around this time of year do you start fertilizing w/ something like a 0-10-10 or do you stop fertilizing once the tree goes dormant? What type of fertilizer do you use during this time(if you use any)? If I use anything in the fall it will be greensand, a mined mineral that has a low level of potassium, essentially an iron potassium silicate, and it weathers and breaks down to release. I prefer slow release, natural fertilizers to inorganic liquids that flush out when it rains or is watered. Sweet tree. And what better place to grow a Japanese maple than Portland OR. Every time I’ve ever been there, I see stunning Japanese maples everywhere I look. I see Japanese maples in Portland bigger than I ever saw them in Japan. We have less than 100 year old trees here that have nearly 2 foot trunks. It’s a perfect climate for them, for sure. I Love what you have done with this tree. Has anybody tried Dyna Gro, Pro-Tek? this stuff helps increase the plants tolerance to heat, drought, winter, and insects! It works well, and I have used it on several of my very old Japanese Maple Bonsai. 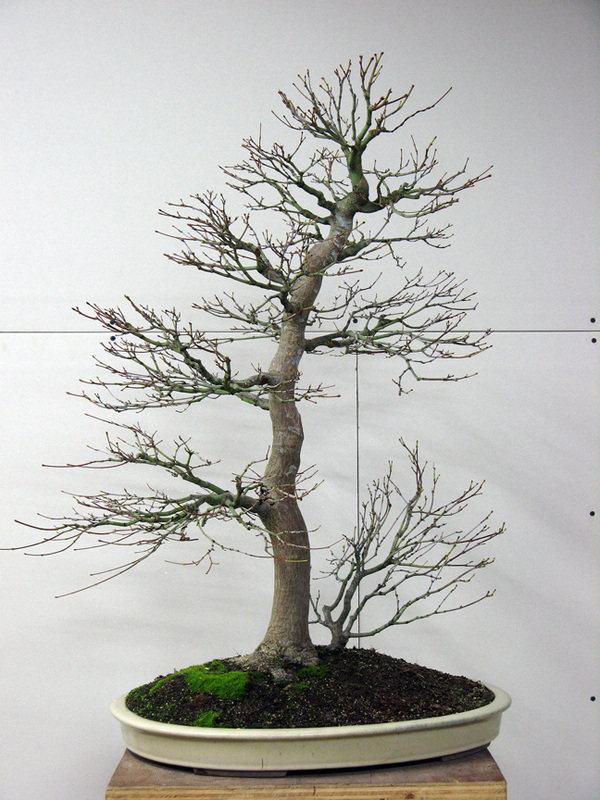 Japanese maples are indeed on top when we talk about artistic plants and trees.. I just love all the photos you’ve shared. I’ve just stumbled across this thread – smashing tree. Do you have any updates? Would be nice to see how it has developed over the last few years.